Martin W. Van Steele was born on 3 February 1885 in New York City, New York. Frederick C. Van Steele and Isabella C. Martin appeared in the US federal census of 1 June 1900 in Saratoga Springs, Saratoga County, New York, at 21 State Street living not far from Isabella's sister Irene Derlick. Also in the household is Jennie Carr, age 19, identified as "sister," but apparently not of Frederick or Isabella.. Other members of the household included Martin W. Van Steele, Henrietta E. Van Steele, Elizabeth V. Van Steele, Edward Harvey Van Steele, Irene Van Steele and Frederick J. Van Steele. Frederick C. Van Steele and Isabella C. Martin appeared in the US federal census of 15 April 1910 in Saratoga Springs, Saratoga County, New York, at 113 Clinton Street and two boarders.. Other members of the household included Martin W. Van Steele, Edward Harvey Van Steele, Frederick J. Van Steele and Irene Van Steele. He was employed as teamster in a livery stable, according to the 1910 census. The following appeared on 3 June 1913 in the Schenectady Gazette: (Saratoga Springs, June 2) Frederick C. Van Steele, a former resident of this village, died in New York Thursday, aged 62 years. He is survived by his wife and five children, Martin, Edward, Frederick and Bessie, all of this village, and Mrs. A. Hinterlan, of Lakewood, N. Y. The funeral was held in New York Saturday. He applied for a passport on 6 February 1917 while living in Cleveland, Cuyahoga County, Ohio. A passport was issued on 8 February for the purpose of a pleasure trip to Cuba, Jamaica, Panama and Costa Rica, leaving from the port of New Orleans aboard the Chalmette on 24 February. 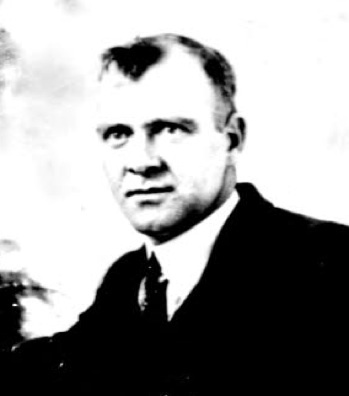 At the time of his application, he was employed as a chauffeur, residing in Cleveland since 1914. The following appeared on 29 October 1918 in the Schenectady Gazette: Miss Lila Mae Wilson, daughter of Mrs. Jennie E. Wilson of 4 North Dean Street, was married to Edward Harvey Van Steele of Saratoga Springs at St. John's rectory Saturday night. They were attended by Miss Anna Shirkey of Schenectady and Mr. Martin Van Steele of Saratoga Springs. He was a chauffeur with his own car, according to the 1920 census. The following appeared on 4 May 1921 in the Schenectady Gazette: (Saratoga Springs, May 3) Mrs. Isabella Van Steele, 62, widow of the late Frederick Van Steele, died today in her home at 87 Nelson avenue. She is survived by her mother, Mrs. Eliza Martin; five children, Mrs. John Shay, Martin and Frederick Van Steele of this city; Edward Van Steele of Schenectady and Mrs. A. J. Hintelmann of Rumson, N. J., also one sister, Mrs. Irene Derlick of this city. The following appeared on 22 March 1923 in the Schenectady Gazette: Apparently having fallen downstairs in her sleep during the night, the body of Mrs. Elizabeth Martin, age 91, widow of Michael Martin, was found at 5:30 o'clock this morning at the foot of the stairway leading to the second floor of her home, 87 Nelson avenue. No one heard Mrs. Martin fall, but physicians stated that death probably occurred about 4 o'clock. She is survived by one daughter, Mrs. Irene Derlick of this city; eight grandchildren, Mrs. John J. Shea, Martin and Frederick VanSteele, Mrs. Walter B. Thomas and Nelson and Otto Derlick of this city, Mrs. A. J. Hintleman of Rumson, N. J., and Edward Van Steele of Schenectady, and nine great-grandchildren. Funeral services will be held Friday morning at St. Peter's Catholic church. The following appeared on 19 April 1969 in the Schenectady Gazette: Saratoga Springs -- Funeral services for Fred J. Van Steele, 77, of 86 Oak St., who died yesterday morning at the Albany Medical Center, will be conducted at 10:30 a.m. Monday at St. Peter's Church. /P/ Mr. Van Steele was a retired engineer of the Delaware and Hudson Railroad, with 53 years of service. /P/ Born in this city and a lifelong resident, he was a member of the Brotherhood of Railroad Engineers, Kinghts of Columbus and the Saratoga Elks Lodge. /P/ He was a veteran of World War I. /P/ Surviving are one sister, Mrs. Irene V. Hintelmann of Saratoga Springs; two brothers, Martin W. Van Steele of Saratoga Springs, and Edward Van Steele of Schenectady; several nieces and nephews. /P/ Burial will be in St. Peter's Cemetery. The Burke Funeral Home will be open today from 7 to 9 p.m. and tomorrow from 3 to 5 and 7 to 9 p.m. The SSDI lists Saratoga Springs, Saratoga County, New York, as the last residence of record of Martin W. Van Steele. Martin W. Van Steele died in March 1971 at age 86. He was interred at St. Peter's Cemetery, Saratoga Springs, Saratoga County, New York. The following appeared in the Schenectady Gazette: Martin Van Steele, 83, of 24 Park Place died early yesterday and had been a resident of Saratoga Springs the past 80 years. /P/ Before his retirement, he conducted a taxi company for many years. Surviving are his daughter, Mrs. Thomas Smith of Saratoga Springs; one stepson, George F. Perkins; one sister, Mrs. Irene V. Hintlemann, both of Saratoga Springs; one brother, Edward H. Van Steele of Schenectady; four grandchildren and several nieces and nephews. /P/ Funeral services will be conducted at 9:30 a.m. tomorrow at St. Peter's Church. Burial will be conducted in St. Peter's Cemetery. /P/ The Burke Funeral Home will be open today from 3 to 5 and 7 to 9 .m.